The PSNI police is to intensify its campaign in south Armagh after coming in for strong criticism over its response to Thursday night’s bomb attack on its empty base in Newtownhamilton. The PSNI police did not appear in the village for up to two hours after a warning call was made to a Belfast hospital, it has emerged. People were evacuated from their homes by firefighters when the PSNI failed to turn up. One man received minor injuries in the blast, while an elderly woman was treated for shock. 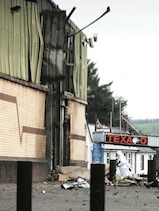 Anti-republican lobbyist Willie Frazer claimed that what he described as “security” in the south Armagh area, once known as ‘bandit country’, was low. “It’s a disgrace - the fact they’re able to drive in there days after the last bomb is just unbelievable,” he declared. PSNI Chief Matt Baggott was also criticised for a highly publicised walkabout in the nearby town of Crossmaglen last week, which was derided by republican hardliners. In the last 24 hours, Baggott made statements vowing that there would be an increase in “visible policing”. “We have said consistently that the threat on my colleagues and the community is ‘severe’ as terrorists continue with their misguided pursuit of destruction,” he said. Members of the Crown forces have said that renewed cooperation between the Real IRA and Oglaigh na hEireann (ONH) in south Armagh means the capacity of the IRA groups is now “at an all-time high”. The British government is understood to be particularly concerned that the groups’ bomb-making skills have advanced to such an extent that the cars being used to transport the devices are being vaporised by the power of the explosions. It is said that the Real IRA and ONH along the border are working closer together than ever before and are actively cooperating on attacks. Baggott said that the PSNI would set up checkpoints throughout the next couple of weeks “and probably beyond that”. “I know they are a huge inconvenience to the public but let’s be very clear the responsibility for us having to do this rests purely and simply with those people that would bring destruction back to the streets. Sinn Fein backed the PSNI chief. “They have got to keep the public safe. They have got to keep police officers safe but they need to do it in a way which wins the public confidence”, Sinn Fein Policing Board member, Alex Maskey, said. Republican Sinn Fein condemned Baggott’s recent patrolling of Crossmaglen in South Armagh as “a publicity stunt” which was used in a misguided bid to highlight ‘normalisation’ for the sake of the media. “The British Chief Constable arrived into the village by helicopter and patrolled the area with several other members of the British Crown Forces for only a matter of minutes while camera crews caught the footage before being ushered into the local hotel for lunch,” the group’s local cumann said in a statement. * In a separate development, a pipe bomb that caused an alert at a retail park in Newtownabbey, County Antrim, is also thought to have been planted by one of the breakaway IRA groups. The Homebase store close to the Abbey Centre on the outskirts of north Belfast was evacuated at about 1.30pm on Saturday while a British army bomb unit attended the scene. The device was later described as “viable”.